The in basket: George Bolton says the intersection of Enchantment Lane and Dickey Road west of Silverdale is difficult because of reduced visibility for those stopped on Enchantment. “When you pull up to the stop sign here, you can’t see up Dickey Road at Enchantment. Three years ago, someone put in a sewer or water line and added more dirt to the berm. “Does state law require a line of sight when you’re stopped behind the stop sign?” he asked. The out basket: It’s not hard to see up and down Dickey from Enchantment unless you are overly worried about stopping only once, at the stop sign. There are a lot of places like it where one has to move forward past the stop sign to get a good view. Deputy Scott Wilson of the Kitsap County Sheriff’s Department called it a common question and cited a state law. It says that unless a police officer, firefighter or flagger directs otherwise, “every driver of a vehicle approaching a stop sign shall stop at a clearly marked stop line, but if none, before entering a marked crosswalk on the near side of the intersection or, if none, then at the point nearest the intersecting roadway where the driver has a view of approaching traffic on the intersecting roadway.” It goes on to require that entering the other street must then be done safely. Finally, Scott offers some common sense advice in a Q&A format. Q1. How far from the stop sign should I stop? A1. There should be a white line painted across the road. You have to come to a complete stop before you cross that line. Once you have come to a complete stop, you may inch forward a little bit in order to see whether or not it is safe for you to proceed. Q2. If there is a distance between stop sign and stop line, should I stop before the stop sign or the stop line? A2. Before the stop line. If needed, you can slowly pull up a little and then stop again when you have a good view of traffic in all directions. Q3. How close should you get to the stop sign before stopping completely? A3. If there is a crosswalk at the intersection, you should stop before crossing it. If there is no crosswalk, stop short of the intersection with enough space that other cars can safely turn in without hitting you. Q4. Where do you stop if the stop sign is before the white line? A4. Stop before the white line. You should stop within two feet of it, so the bumper does not go over the line. The in basket: Paul Werner of Central Kitsap told me in a phone call that stop signs with flashing lights had turned up at on Fairgrounds Road where it crosses Old Military Road. I had seen those solar powered signs at a trade show at Sea-Tac last winter and the county said afterward that they might use them, but were noncommittal. I asked the county about their first use here (other than one on the Bangor Navy base) and whether we’ll be seeing more of them. The out basket: Jeff Shea, the county’s traffic engineer replied, “We have, in fact, installed a solar-powered flashing light stop sign on the two legs of Fairgrounds Road at Old Military Road. “This intersection was being considered for an overhead flashing beacon due to its collision history. We are evaluating the effectiveness of these flashing stop signs in lieu of the overhead beacon. “The flashing sign is less expensive (approximately $1,600 each for the signs versus about $10,000 plus ongoing electricity costs) and installation is significantly easier than the overhead beacon. The signs will flash continuously as long as the solar power keeps them going. Jeff said a version activated by an approaching vehicle exists but is more expensive. They’ll know more about how the solar power will do in the dark of winter after it goes through one. The location of Fairgrounds Road has pretty good exposure to the sun, he said. 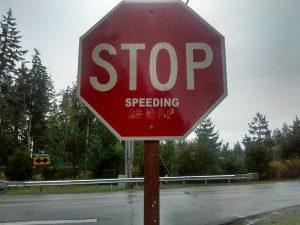 If the signs stop flashing, they’ll still be stop signs. The in basket: Merilee Kuklinski of East Bremerton was surprised when a stop sign went up early one day in mid-August on Winfield Avenue in its downgrade at 14th Street in Bremerton. She was even more surprised that no warning of the change was made, such as a red flag on the new sign. I was curious about the reason this intersection, a three-way stop for as long as I can recall, now is a four-way stop. Another stop sign, stopping Winfield traffic at Lower Wheaton Way, is a short distance ahead. You can see it rising like a moon over the new stop sign as one drives downhill on Winfield. The out basket: Though on a city street, the modification was done by the state as part of its detour route during closure of the Harkins-Lower Wheaton intersection for construction of a roundabout at the east end of the new Manette Bridge. But it was visible sooner than expected, said Jeff Cook, project engineer on the bridge job. “The sign should have been covered until the detour went into effect on Sept. 6,” he said. “Unfortunately it was not. It was brought to our attention, and the contractor took immediate corrective action in covering the sign. into providing advanced warning signs to avoid confusion when the switch is made,” he said.